Who: Los Angeles County Sheriff’s Department Executive Officer Neal Tyler, Assistant Sheriff Richard Barrantes, Transit Division Chief Ronene Thomas, Commander Judy Gerhardt, Captain Karl Schow, Los Angeles County Metropolitan Transportation Authority Board Deputies Jennifer Brogan and Dave Perry. What: The Transit Policing Division of the Sheriff’s Department and the Los Angeles County Metropolitan Transportation Authority will co-host the Partnership in Safety Commuter Appreciation Day at the Metropolitan Transportation Authority Rosa Parks Passenger Station. This late afternoon event thanks the community for their patronage and partnership in keeping the Metro Transit System one of the safest in the country. 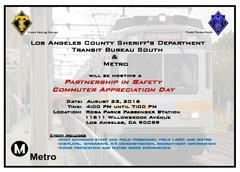 Los Angeles County Sheriff’s Department Transit Policing Division will partner with the Los Angeles County Metropolitan Transportation Authority (Metro) to host a late afternoon event, thanking the communities they serve for their patronage and partnership in keeping the Metro Transit System one of the safest in the country. LASD Executive Officer (Undersheriff) Neal Tyler, Assistant Sheriff Richard Barrantes, Transit Division Chief Ronene Thomas, and Metro Board of Directors Deputies Jennifer Brogan and Dave Perry, will greet members of the community and tour the exhibits and displays. This is the first time that Metro and the Sheriff’s Department have partnered in an event of this kind. The Transit Policing Division of the Sheriff’s Department provides police services to Metro under contract and has done so for over 25 years. The Transit Policing Division, formerly known as the Transit Services Bureau within the LA County Sheriff’s Department, has historically had a great relationship with transit patrons. Crime is currently trending down on the Metro system over the same time period last year, and the Sheriff’s Transit Policing Division remains committed to protecting the transit landscape in L.A. The Sheriff’s Department will have displays and exhibits from their Explosives Detection K9 teams, Threat Interdiction Unit (similar to SWAT), and Recruitment Units, to name only a few. 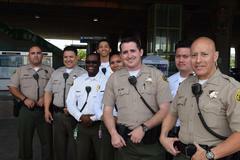 Transit deputies will also be available to answer questions and interact with Metro patrons and the general public. Metro will have information booths and exhibits about plans for the new Willowbrook Station, Senior and reduced fare TAP card programs, other transit education programs, and employment opportunities within Metro. The Metro Board of Directors and Executive staff have been invited and may attend schedules permitting. For further information about this event, please contact Public Information Officer Ramon Montenegro, Los Angeles County Sheriff’s Department, Transit Policing Division, at (213) 922-3649.